One of the primary advantages of cloud computing has always been the ability to scale up to meet short-term needs and scale back when that need has been met. In other words, you don’t have to pay for infrastructure that you don’t need to hedge against heavy usage. That has mostly meant server capacity, but over time it has been applied to other cloud services. Now, developers can configure auto scaling across a set of AWS services in a single unified interface. Companies typically use multiple AWS services to build their applications, and up until now that required some work to make sure the various pieces were scaling as the application required it. In a company blog post announcing the new feature, Amazon’s Jeff Barr explained how the new service greatly simplifies auto-scaling for developers. “You no longer need to set up alarms and scaling actions for each resource and each service. Instead, you simply point AWS Auto Scaling at your application and select the services and resources of interest. Then you select the desired scaling option for each one, and AWS Auto Scaling will do the rest, helping you to discover the scalable resources and then creating a scaling plan that addresses the resources of interest,” Barr wrote in the blog post. The new service gives developers a set of auto-scaling options, offering a way to balance cost, availability or a combination of the two, depending on your company’s and the application’s specific requirements. 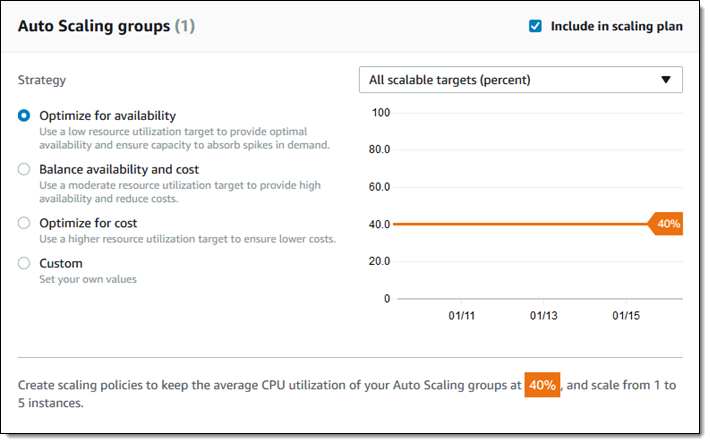 As you set up a given scaling threshold, AWS Auto Scaling actually can create a set of scaling policies automatically, based on your configuration. The way it works is you select an application, then create a scaling configuration plan where you set scaling targets for each resource. This new feature is available immediately in US East (Northern Virginia), US East (Ohio), US West (Oregon), EU (Ireland), and Asia Pacific (Singapore) regions.